This particular coffee farm is owned by the Salina’s family, who have passed down the plantation through three generations of hard work and passion. The Arabica sub species ‘Caturra’ and ‘Typica’ are planted on their plot of land which naturally flourishes in this region. The plantation is situated in the Southern Province of Loja, Ecuador. Due to its close proximity to the Equator, Ecuador experiences high temperatures all year round and 12 hours of daylight that allow for a consistent crop to generate year after year. The coffee is pulped at the plantation and fermented in tiled tanks overnight. The high temperatures also allow the coffee to be dried on raised beds, this is a preferred method among coffee farmers as the beans can aerate and dry evenly. Loja is a pleasant, well-balanced coffee. Due to its washed process, it offers a great lemon/lime acidity. The dry aroma gives an instant hit of honey and dried rose petals, which excites the palate before the coffee touches the lips! There are lingering aftertastes of cacao and red currant which match with milk perfectly, if a flat white or latte is your choice of drink. This coffee is roasted on an open-flame in 10kg batches, the movement in the drum gives a consistent, medium roast which cannot be matched. It is available in beans or ground and always freshly sealed before delivery. We place the beans in to the roaster in small batches at a temperature above 200°C. Ensuring the beans are of a similar size and shape, we can get a nice, even roast. The case of the beans is then hardened with direct flame roasting. It allows us to create high levels of roasting without the delicate flavours of the beans, which can be lost in conventional oven baked roasters. While flame roasting, the beans are constantly rotated in the drum to achieve a consistent roast. The experts check the beans every few seconds, waiting for the perfect colour, size, surface texture and smokiness. Once the desired results have been achieved, the beans are left to cool on a tray. Once roasted the beans will release gases. This is why we package them in a valve bag to allow the beans to continue to release gases, while not allowing any air in. The packaging has been specially designed to protect and preserve the flavours and aromas. Vacuum packing is much more harsh and can strip away these flavours and aromas. 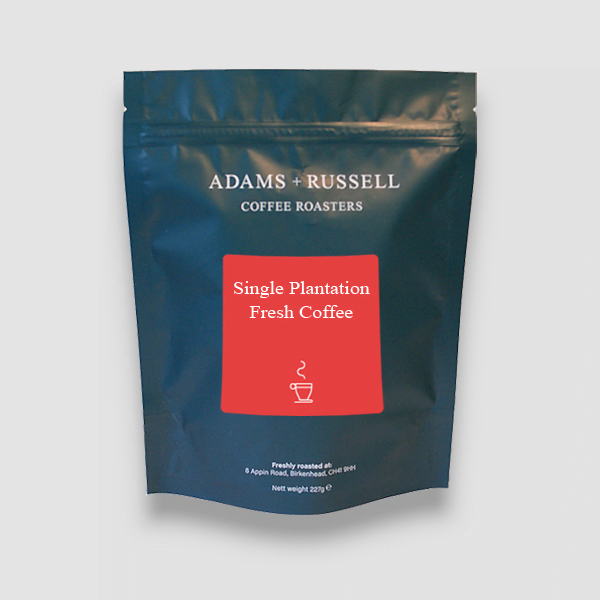 The flavours of this delicious coffee can be hindered if it is brewed incorrectly. If you opt for beans, you will first need a grinder. There are a few options when brewing. For coffee on the go, our Aeropress brews fresh coffee in just 11 seconds. A cafitiere is also a great way to brew on the go. For brewing in the comfort of your own home, why not try a stove top espresso maker or a v60 drip.